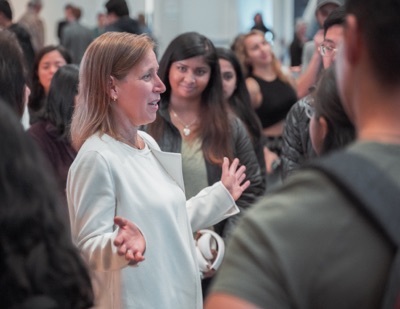 Tech titan Susan Wojcicki urged college students to pursue careers of meaning and impact in fields that are growing—and to be flexible and humble as they begin their work lives. "You don't have a lot of skills yet. Be flexible," Wojcicki told a crowd of several hundred, including many students, that gathered in the Colleges 9/10 Multipurpose Room on Saturday morning. "Join a great company where you're going to learn. Be open and willing to do anything that's asked." That advice was among the gems alumni Wojcicki (M.S., '93) and her husband Dennis Troper (M.S., '93) offered during a free-ranging, hour-long conversation with Executive Vice Chancellor Marlene Tromp about their path from the redwoods to the highest echelons of YouTube and Google. Wojcicki and Troper, who directs product management for the wearables division of Google, met on campus as graduate students in the master's in applied economics program. They married in 1998—one year before Wojcicki joined Google as employee No. 16. Today, as hugely successful tech leaders and the parents of five children, Wojcicki and Troper have plenty of opportunities to give career advice to college students, and their own kids. "When our son wanted to work at Pixar, I told him to say, 'I'll do anything. I'll take any job at Pixar,' " she said. "Once you're inside, it's easier to move around. Learn skills, do a great job, and you'll be positioned for your next job." What's the world going to look like in 10 years? One of the most powerful and accomplished women in Silicon Valley, Wojcicki was five months pregnant when she signed on at Google. "It didn't seem like a risky decision," she recalled. "I saw that this is the future." That willingness to embrace the unknown has propelled Wojcicki's career. "I tell people to think about what's meaningful to them and to choose areas where you see growth," she said, adding that she sees a lot of opportunity in technology. "We're at the beginning of this revolution." "Following your passion is really important," added Troper. "Don't follow the easy route. Challenge yourself to get the hard work done." Wojcicki sees the medical field being transformed by technology, through drug discovery, apps, and genetics, while Troper noted that climate change poses another huge opportunity for tech entrepreneurs. "I say, ask yourself what you think the world will look like in 10 years—I ask myself that, too—and then work backwards," said Wojcicki. "What's going to be big in 10 years that's not big today?" As a woman in tech, Wojcicki has faced challenges, some of which she attributes to "unconscious bias." "I try to give people the benefit of the doubt—and I also make sure it doesn't get in my way," she said, describing techniques she has developed over the years. "I'll tell people, 'I already know that.' Or 'I'm the world's expert in that.' Or 'I developed that system.' "
"Try to think positively and try to make it work," she said. "When it's an issue, bring it up. And try to be in a place that's fundamentally supportive." At YouTube, the biggest challenges facing the company today are ensuring high-quality content, matching it to users, and striking the balance between censorship and free speech, said Wojcicki. Days after 49 people were killed in attacks on two mosques in New Zealand, Wojcicki emphasized that YouTube has always removed content that promotes hate or violence or contains adult content. With 500 hours of content being uploaded every minute, YouTube relies heavily on machine learning to flag content for removal. The company recently changed its algorithms and is in the process of rolling out "big changes" globally, she said. But it's a "gray area," said Wojcicki. "If we're not careful, we'll be removing voices. We want to enable all different voices as long as they meet our policies." Education, cautionary tales, and "knowing how to hustle"
Wojcicki, who earned an undergraduate degree in history and literature from Harvard, credits her two years at UC Santa Cruz with giving her the quantitative skills in math, statistics, economics, and econometrics that propelled her career in high tech. "I value my humanities degree," she said, noting that her background helps her grapple with big questions and the implications of decisions. But data analysis is at the core of all of Google's operations, and she relied on quantitative skills when she managed the ad systems that generate revenue for Google. "That foundation really enabled me to do that job," she said. Troper said UC Santa Cruz "gave us the tools… to try to make sense of the world. At Google, it's all about having the tools to build products we think people will love." Asked if they had any "cautionary tales" for students, Wojcicki recalled a commencement address that focused on the tale of the Titanic. "Remember, the Titanic was about a person with hubris who made a big mistake, and people died as a result," she said. "It is possible to really screw up. That stayed with me." When the tech bubble burst in 2000, many successful people lost everything, and empty buildings dotted the landscape of Silicon Valley. "It's really important to stay humble and aware and cautious that you can make mistakes," she said. "Always being self-reflective is super valuable." Troper, who grew up in Costa Rica, said he followed the traditional path from school to college to work—"because nobody taught me better." In retrospect, he wishes he had taken more advantage of all the resources and extracurricular activities that were available to him in college. "Get involved in things other than the three or four courses you're taking," he advised students in the audience. "It really matters in the formation of you as a person." Asked what universities can do to encourage and develop entrepreneurs, Wojcicki said entrepreneurs "need to know how to hustle." "How do you present an idea? How do you get people to believe in you? How do you lead other people? How do you think about an idea—something that doesn't exist—and convince people they need it?," she said. "When we were starting Google, we had to do that." Troper said the best entrepreneurs he knows are "very personable and they understand and cherish having diverse people around them. Understand cultures beyond your own." Diversity is important for its own sake, but it also makes products more successful. For example, he said, heart rate sensors on smart watches perform differently on different types of skin. "Diversity is really important in all the companies we run," said Wojcicki, noting that . "Our audience is diverse. Two billion people come to YouTube every month. The people we hire represent the users we serve, and the creators we serve." After the event, Tromp expressed appreciation for the duo’s willingness to return to campus and share their wisdom with students. "Susan and Dennis are extraordinarily warm and generous people, and they have so much to offer our students and this university," she said. "Their paths demonstrate that students in all of our majors have something to offer big tech and have the training to shape our nation’s future. It was an honor and a delight to spend time with them."